I am a day behind this weeks for the meal deal! The days just flew by. Trying to get last minute things done around the house! With Father’s Day coming up this weekend I wanted to really fix a great meal for Dad! We all know that they deserve to sit down to a great meal on Fathers’ Day, and Mom shouldn’t have to spend the whole day in the kitchen. 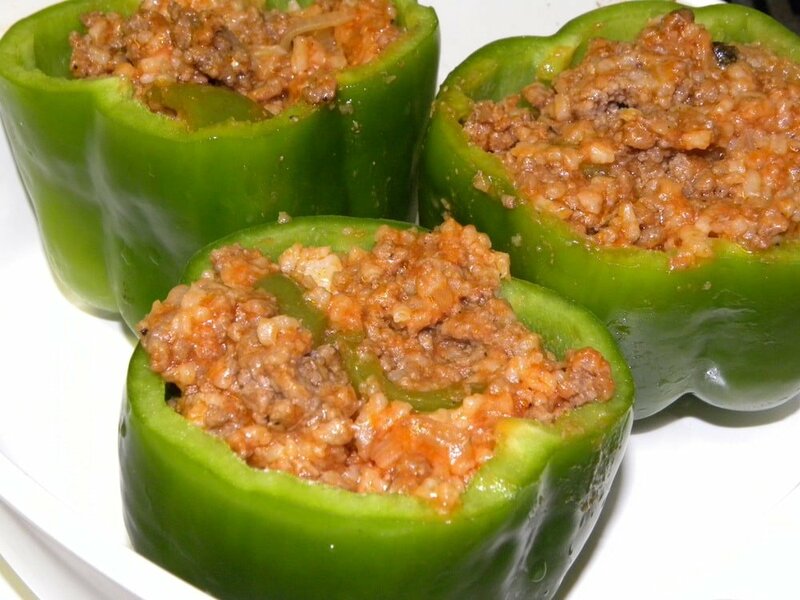 I love these peppers because you can make the filling in advance. That way you can just have the peppers in the fridge ready to go in the oven. You can also make these ahead and freeze them! I am a huge fan of those aluminum throw away pans from the dollar store! They are perfect for make ahead meals. Hmmm…there is an idea. One week we may post a bunch of Freezer cooking meals. Enough for a week! Sounds like a plan to me! These stuffed Bell Peppers were the perfect choice this week with all of the summer veggies coming into stores at great prices. Bell peppers can be so expensive if you don’t purchase them in season. You can of course play with the recipe a bit and use yellow or red peppers, but my favorite are the green ones. They have such a great flavor. This recipe is one of my larger ones. You will have enough to feed 6. You can always half it, or freeze the extras. Makes a fast an easy dinner for another night of the week! 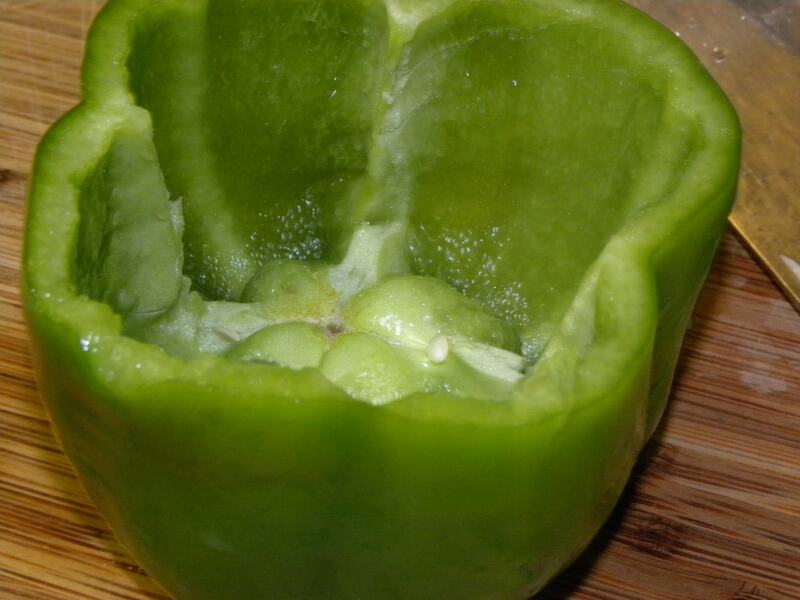 Cut a thin slice from the stem end of each bell pepper. Remove the seeds, and membranes from the inside until it is just the shell. 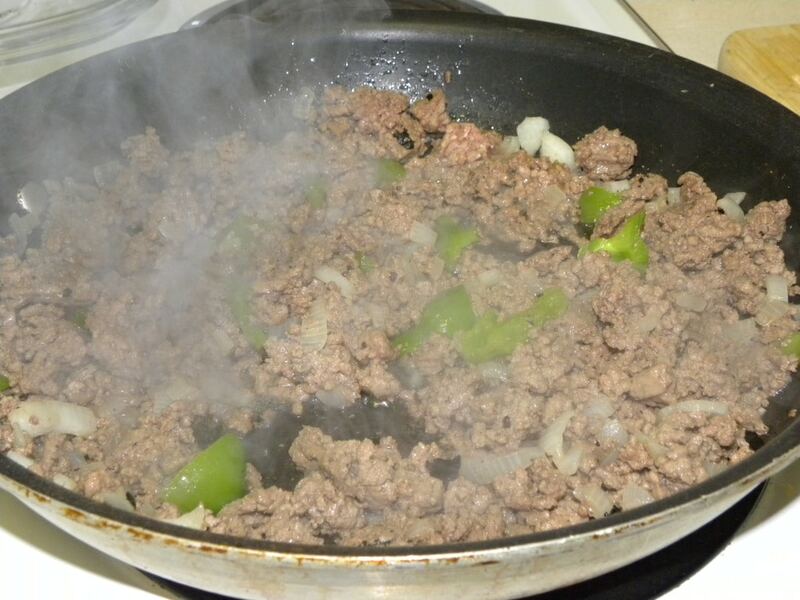 In a large skillet cook the beef, onion, and garlic over medium heat until the beef is cooked through. Drain and return to skillet. Add 8 oz of tomato sauce, salt, pepper,and rice to the beef mixture. Stuff peppers with beef mixture and stand them in a casserole dish. Pour remaining tomato sauce over peppers. Cover and bake for 45-50 minutes, or until peppers are tender. 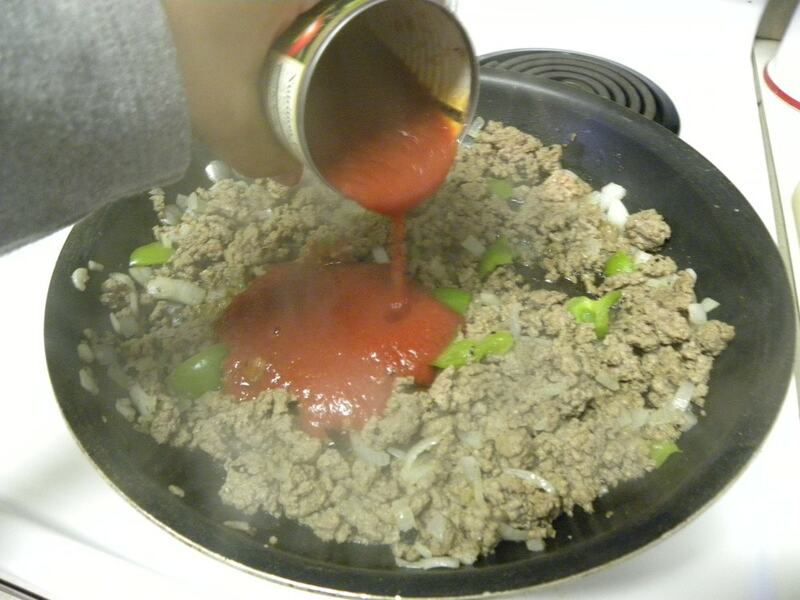 Add 8 oz of tomato sauce, salt, pepper, and rice to the beef mixture. Pour remaining tomato sauce over peppers, and top with cheese (if desired). Cover and bake for 45-50 minutes, or until peppers are tender. I am making it!- looks so yummie and easy. I am not too much of a cook (yet) but since i started to look at your recepies for last few weeks I am inspired! Thank you Amanda! I’m wondering if you could do this with shredded chicken instead? Also, could you put parm. cheese in the filling? I’m thinking an Italian chicken parm. 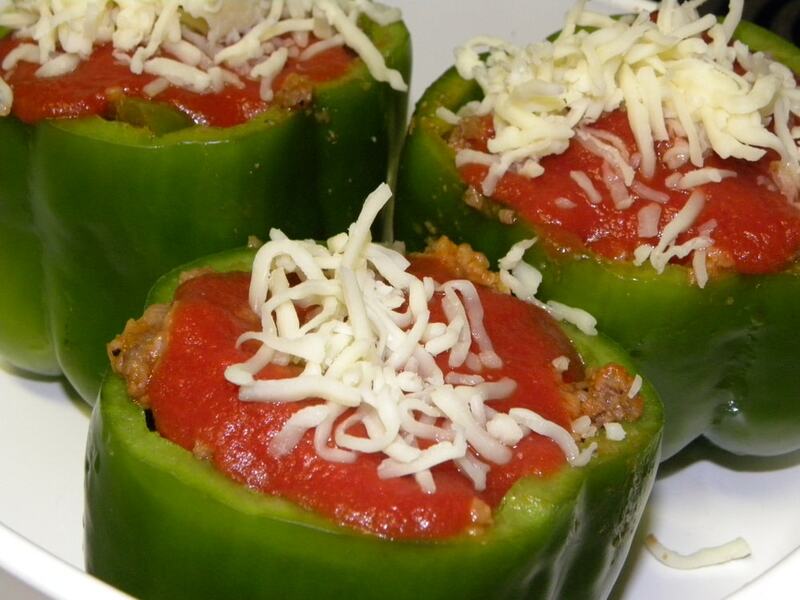 stuffed peppers. I’m not much of a cook either but this sounds GREAT! At what temperature do you bake these? Quick question, though – how do you heat them back up after they’re frozen? Do you use the microwave or oven, and for how long? I typically let the thaw in the fridge and then pop them in the oven at 350 for about 20 min until they are warm. I make mine very similar to yours. I freeze in seal-a-meal bags in individual servings so all you have to do is pop into some boiling water or cut a slit in bag and micro it. I love them so I always make sure I cook for an army when making them!! I think the idea of a weekly freezer meal it great! If you decide to do this I will gladly contribute! I just thought I would throw out this idea in case someone else could use it. My husband and I get Chinese every once and a while.They give use white rice extra with what ever we order but I never know exactly what to do with it, it just popped into my head when I was reading this recipe of yours, that now here is a great use for that white rice we get. Thanks allot.